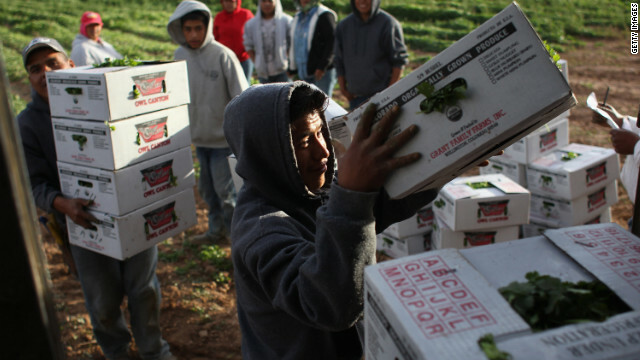 Migrant workers load cilantro in Colorado. The farmer said business is suffering because there are fewer Mexican workers. Editor's note: Jeffrey S. Passel is a senior demographer at the Pew Hispanic Center and a nationally known expert on immigration to the United States and the demography of racial and ethnic groups. D'Vera Cohn is a senior writer at the Pew Research Center. From 1985 to 2006, she was a reporter at The Washington Post, writing chiefly about demographic trends and immigration. (CNN) - To those of us who have studied the largest wave of immigration in history from a single country to the United States - the four-decade-long influx of millions of Mexicans - it seemed inconceivable that it would ever come to a halt. Yet, as our new Pew Hispanic Center report has shown, it has. Our analysis of Mexican and U.S. data sources indicates that at least as many Mexicans and their families are leaving the United States as are arriving in the United States from Mexico. As a result, the Mexican-born population in the United States decreased from 12.6 million in 2007 to 12 million in 2011. This appears to be the first sustained decline in the number of Mexican immigrants since the Great Depression, and it is entirely because of a reduction in illegal immigration - more going home and fewer coming. Today, we estimate that 51% of all Mexican immigrants living in the United States are unauthorized. In 2007, that figure was 56%. Certainly mental or phcyisal health problems, and certain personal upheavals (ie death of a spouse or child), can render a person unable to work and result in poverty. But for most people, moving to an area where there are jobs, cutting back on drugs & alcohol, or just being willing to endure the indignities of work (ie getting yelled at by idiot bosses or customers), is all you need to live a reasonable lifestyle. For the most part, poverty is not caused by class conflict, but by personal issues. even the mexicans know socialism is failure. Its too late. You can erase my comments. The world already knows whats going on. Can you say BUSTED!